Bedfordshire and Surrey county councils have both turned to four-wheel drive quad bikes to help keep pavements and inaccessible routes clear of ice and snow. The bikes are “fully-equipped” for winter and will operate alongside the councils’ fleets of gritter lorries. Fitted with a de-icing spray and snow plough at the front and towing a small grit container, the bikes will be used to clear pedestrianised areas in town and routes that prove inaccessible to the lorries. Surrey County Council has more than 40 normal gritters at its depots and nearly 17,000 tonnes of salt. 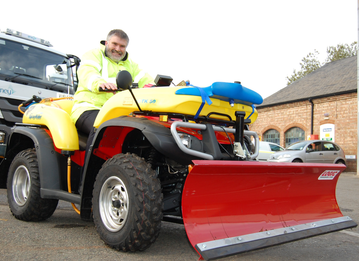 In Bedfordshire, mayor Dave Hodgson said: “We are committed to doing all we can this winter to keep the borough moving. “This year, I am delighted to announce we will also be using a quad bike to grit pedestrian areas in the borough.